Various colors codes depict different aspects of cloud coverage and other criteria for scheduling continuum projects. In short, the times when conditions are best for continuum observing are those where blue extends from the top to the bottom of the figure. Any shade of white, cyan, or magenta indicate less than perfect continuum conditions. Medium Magenta: the atmospheric contribution to the system temperature exceeds 50 K at the labeled elevation. Light Magenta: the atmospheric contribution to the system temperature exceeds 35 K at the labeled elevation. 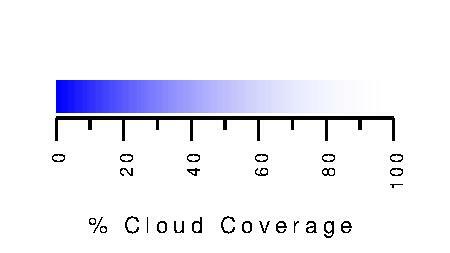 Central thick band, which uses a color ramp that goes from blue through white, indicates percentage of optical cloud coverage. As the legend shows, white represents full cloud coverage and blue represents clear skies. Cloud cover forecasts are from the Green Bank Point Map forecasts. 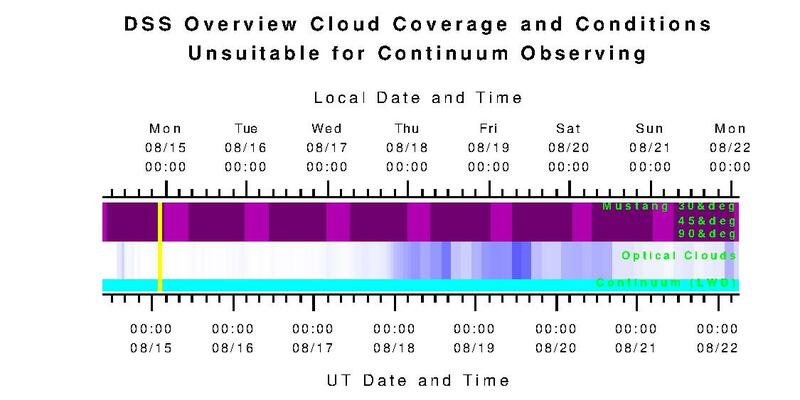 Cyan band at the bottom, if present, indicates those times when we believe conditions are unsuitable for continuum observing for receiver systems other than Mustang. The criteria is based on a maximum downward long-wave irradiance (LWd) of 300 W/m2, which is the upper limit per the accepted Dynamic Scheduling System guidelines for continuum observations (DSS memo 14.2; Dana S. Balser, Atmospheric Stability from GBT Continuum Observations, 2010). LWd data are derived from the NAM and GFS3 model forecasts. Black, if present, show when forecasts do not exist for the indicated time.